So I’m expanding the bounds of our weekly Fiction post to talk about a subject near and dear to my heart—movies. After all, like books, movies are all about story. And every year between Thanksgiving and Christmas some of the year’s best movies tend to make their debut. Here are a few I’m looking forward to in the next couple of weeks. 12/9/11 Tinker, Tailor, Soldier, Spy-Based on John le Carre’s inimitable novel featuring George Smiley, this reboot has a great cast of character actors including Colin Firth, Mark Strong, Ciaran Hinds and Benedict Cumberbatch. With that kind of quality, the tension should be through the roof. 12/16/11 Oh, December 16th…A day fraught with new releases. A day fraught with difficult decisions. While there’s no doubt that the kids will vote for Alvin, Simon and Theodore, my darling husband has already declared his desire to see Mission: Impossible-Ghost Protocol. What’s it about you ask? Um… Stunts and explosions. That’s pretty much what I can tell at this point. In other words, it’s right up his alley. The really interesting release coming out that day is Sherlock Holmes: A Game of Shadows. Can’t wait. The first one had a steampunk edge, but I think this one will have a heftier dose. Not to mention Jude Law is very dashing as Dr. Watson and a perfect foil to Robert Downey Jr’s Holmes. I really enjoyed the first installment with it’s radical interpretation of Holmes’s character. It was also a great buddy flick. Here’s hoping that the second is just as compelling. 12/23/11 We Bought a Zoo-This looks like a feel-good family movie. Supposedly based on a true story. Not sure it’s a project I’d want to tackle in real life, but it does seem like an interesting premise for a movie. 12/25/11 War Horse-I’m a little on the fence about this one. Pretty sure that I would need to smuggle in a Costco-sized box of Kleenex. But it looks to be a moving and beautifully filmed movie. With all these movies coming out a burning question remains… if we go to see them all how will we ever afford presents? Here’s a second burning question: What movies are you looking forward to? Or have you seen anything good recently? Has anyone seen Hugo? What did you think? 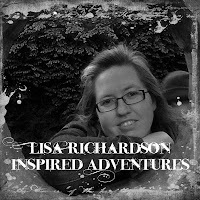 Influenced by books like The Secret Garden and The Little Princess, Lisa Karon Richardson’s early books were heavy on boarding schools and creepy houses. Now that she’s (mostly) all grown-up she still loves a healthy dash of adventure and excitement in any story she creates, even her real-life story. She’s been a missionary to the Seychelles and Gabon and now that she and her husband are back in America, they are tackling a brand new adventure, starting a daughter-work church in a new city. Her first novella, Impressed by Love, part of the Colonial Courtships collection, is coming in October, 2012. Sounds like some nice family-friendly offerings coming up. And I am looking forward to the second Sherlock Holmes. (Although I may wait until I can Netflix them.) I like the steampunk too. I had toyed with the idea of writing one, but then set it aside. I just saw the previews last night for "We Bought a Zoo". it's one I definitely want to see. 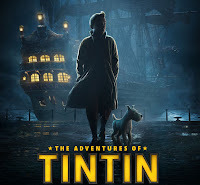 Also "Tintin". Although, Lisa, no one will go with me to animated films. My son would if he still lived here, my dad would if he still lived here. I've pretty much given up on watching movies in theaters. In addition to the cost, I almost always leave with a headache from the volume. The movies I would like to see right now are already out. The Help and The Muppet Movie are at the top of my list. Any good romantic comedies right now? Those are my favorites. Barb, I'd love to read your take on steampunk! You should pick it up again and we can trade the final results! Suzie, I'd go with you if we lived closer to one another. I actually enjoy going to movies on my own. Fewer interruptions that way! I am partial to Jude Law's Dr. Watson. But Mr. Holmes is certainly very attractive as well. Sorry you can't enjoy the whole moviegoing experience, Dina. The Help is awesome. They were pretty faithful to the book, and the one subplot they cut made it even better in my opinion. I will probably get The Muppet Movie from Redbox. I like Amy Adams. I actually can't think of any good romantic comedies that are out at the moment. Anyone else? Don't laugh, but I'm still hoping to see Cowboys and Aliens on the big screen. We checked the cheap seats this weekend but it wasn't on. Just as well as I realized Nick and Nelson had to get back early to practice for worship the next morning. C&A was due out on video yesterday, so I guess I'll look for one next time I go in. 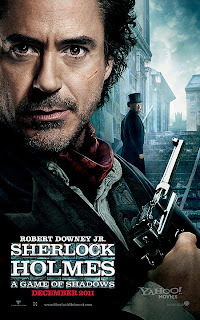 Looking forward to Sherlock Holmes although it'll be summer before I see it. Will miss the Steampunk angle. Movie watching just isn't a big part of our lives anymore. Not enough time when we go to the city and nowhere to rent videos around home - unless you drive to the city and then you never get them returned on time. Still, I can dream about them and watch the trailers. Thanks for the info, Lisa. So Anita, do you have access to Netflix there? I didn't get to catch Cowboys and Aliens. It doesn't seem like it was in theaters for long. I'll probably rent it now that it's out on DVD. DeAnna, I thought Hugo looked like it might be good too, but I don't know anyone who has seen it. I guess I'll take that endorsement, I haven't heard anything else about it pro or con! Lots of movies here I want to see, too! Hugo got good reviews, but I don't know anybody who's seen it, either. I would like to see We Bought a Zoo with the kids. Several others are on my list but realistically, I'll probably have to rent them. Susie, if you're looking for a single movie that the whole family can watch and enjoy, that's probably the one to go with. Matt Damon is an excellent actor too, so you know you won't be wasting your money! I'm really looking forward to War Horse we dont get it until the Middle of January:( Unfair, especially as Michael Morpurgo who wrote the book is British. Anna, that is a bummer. If it's any consolation we have to wait interminable amounts of time to get the newest BBC productions. There are several that I'm chomping at the bit to see! 'Twas the Week Before Christmas? Welcome Roseanna White, Summerside Author!